Beautiful Voices is our ongoing blog series that highlights inspiring, empowering women. Our most recent Beautiful Voice is Lisa Papp. See what she says when Annmarie asks her some questions about her own personal beauty. Lisa Papp is an author and illustrator. Her newest picture book (launches in 2016) is about a struggling young reader who overcomes her fears with the help of an enormously courageous dog. If you’d like to see more, please visit her website at LisaPapp.Com, and her illustrated blog at LisasGardenDiary.Blogspot.Com. “You can’t write it for anyone else. You only know how to write it for you.” She was talking about a novel, but it is true with life. You need to write your own story, and there’s no way to please everyone. I am most at peace in the garden, mine or anyone else’s. Once you’re in there and settle down, you hear all the good stuff—the butterflies, colorful flowers, the passing breeze; it’s such a tranquil conversation. My other sanctuary lies just beyond the grove in my backyard…a rolling sea of grasses and wildflowers. When I need to regroup, I walk the meadow. Perhaps because of its size, the meadow is a great balancer. I have a “gratitude bench” tucked along one of the paths. 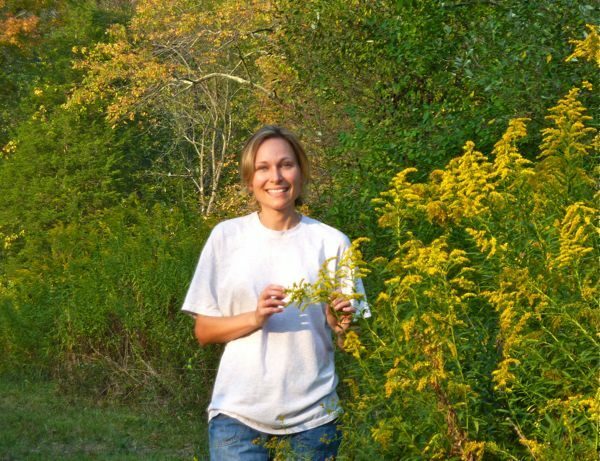 A few minutes gazing at goldenrod, or listening to honeybees, and my mind settles. Once again, I’m in touch with the world. No matter what the season, I’m gifted with new sights, new sounds, and a feeling that all is well. The people I find most beautiful are those who laugh a lot. Those who don’t take life so seriously. Those who are willing to show their belly, and not be perfect all the time. It’s a pleasure to be around people who accept themselves just as they are. I think this is a key piece of wisdom, and a beautiful skill. Those who have mastered it, or perhaps never lost it in the first place, have such a comfortable energy about them. They simply honor the talents that make them unique, and find great joy in sharing their gifts with the world. It’s very beautiful. A walk in the meadow when the tiny, migrating birds are passing through. Usually in autumn, the air is crisp and full of anticipation. The little travelers are so cheerful, you can’t help but join in their happiness. I love feeling a part of everything, a part of the natural rhythm of life. Oh, it’s got to be happiness. Annmarie’s enthusiasm for our natural world just makes me smile. I feel grateful to support her company because I know I am also supporting the Earth, and everyone we share it with. To me organic is not just what it’s grown without –chemicals and pesticides—but also what it’s grown with—awareness, gratitude, responsibility, and compassion. This ancient approach benefits all living things. I believe caring for the Earth and for ourselves is the same thing. I am so happy to use products that celebrate this beautiful symmetry. When you see something that is beautiful, that is a little piece of yourself waiting to be recognized.